the equivalent to black Friday in terms of school/office supplies. You see, right before school starts office stores have killer sales. While I can’t believe it is that time again… this makes me glad it is. 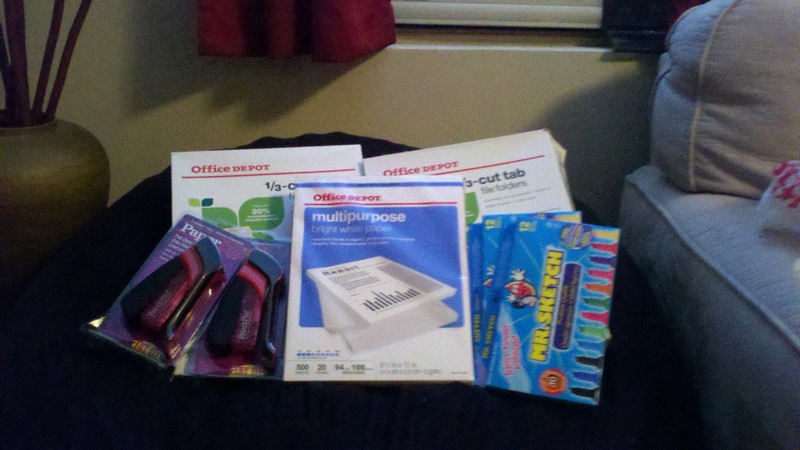 For example today I went to Office Depot. There I have a Work Life Rewards Card, that gives me $$$ back based on what I spend and what I buy. That does not seem that great right? 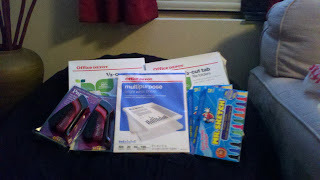 But the key is I got 100% back on everything except the paper, which after mail in rebate I only paid $1 for. So in short I may have spent $50, but I am getting back $60 (that’s right I basically made money to spend on my next trip). But even better, I used my rewards from previous purchases to pay for this one… so really I barely spent anything at all, in order to get money back. I also did this with Office Max. Now, this store is not as convenient for me, so I made my purchase online knowing as long as I “spent” $50 I would have free shipping. No extra shopping trips for me! Office Max has two programs, one for teachers, and one for anyone (I think the one for teachers is a little better, so if you can, sign up for that one!) On this order everything was also 100% back. I also used my previous maxperks to buy, so I am making more than I am spending… wahoo! ***Side note: I went to Office Max through EBATES and also made 3% cash back on my order. The moral of the story, you can get school supplies for free… so you need to get them when they are on sale… so you rarely have to pay full price!